Accutane is sometimes almost a miracle drug for cystic acne, but this potent drug can cause significant side effects. Accutane is usually a drug of last resort for acne, used only when all other treatments fail. Many people who use Accutane, however, fail to realize the potential for serious complications in treatment. Accutane can lead to numerous side effects, but the most common is drying of the skin and mucous membranes. Accutane is a potent drug that can cause serious side effects. The most common side effects of Accutane result from drying of the skin and mucous membranes. About 90% of people who use Accutane experience irritation at the corners of the mouth. Avoiding flavored lip balm and using toothpaste that does not contain the ingredient SLS can help reduce this symptom. About 40% of people who use Accutane suffer dry eyes. Liquid tears remedy the problem. Other side effects of Accutane are rare, but extremely serious. In the USA, both men and women who use Accutane will have to be enrolled in the iPLEDGE system, requiring updated medical information every 30 days. Every case of common acne begins with an event known as retention hyperkeratosis. For reasons that researchers do not yet understand, the linings of a pore in the skin start to produce cells at an unusually fast rate. They begin to tighten the pore so that sebum cannot drain. After a few days to a few weeks, these additional cells in the lining of the pore are shed so that younger cells beneath them can come to the surface. They form a clump in the pore that blocks the flow of oil and traps acne bacteria. The immune system attacks the bacteria with inflammation and makes the pore even tighter so that a whitehead or blackhead forms, or the lining of the pore begins to break down, causing a pimple. Sometimes there is also hyperkeratosis of the skin surrounding the pore. Skin can grow over the pore, trapping sebum and acne bacteria inside. The immune system continues attacking the bacteria, destroying more and more healthy skin tissue until a cyst or a nodule forms under the skin. Accutane reverses this process by making hyperkeratosis less “hyper.” It reduces the production of an enzyme called telomerase, which repairs cellular DNA. Without the action of telomerase, cells die more quickly and can be flushed out of pores and off the skin. It also activates a gene that codes proteins to make neutrophil-gelatinase associated lipocalin, an enzyme that breaks down the “glue” that holds clumps of dead skin cells together inside pores and on the skin. Pores begin to open from the inside out, spilling their contents on the skin. The chemical changes induced by Accutane are temporary, but clearing of the skin may be permanent. Accutane is found under a variety of trade names. In the United States, the drug formerly known as Accutane has been marketed by Hoffman-La Roche a Roaccutane since July of 2009. In other countries, the same drug is sold as Acnotin, Amnesteem, Claravis, Clarus, Decutan, Isohexal, Isosupra, Isotane, ISOTRET, Isotroin, Izoteik, Oratane, Ruatine, and Sortret. There also is a lotion made with the same drug marketed as Isotrex and a combination of Accutane and erythromycin sold as Isotrexin. What Can Go Wrong with Accutane? Accutane is a very effective treatment for cystic acne that can and often does cause serious side effects. Because the drug breaks down the “glue” that holds skin cells together, it often causes itchy peeling of the skin. Oral Accutane causes dryness of the skin and mucous membranes. Dry skin can cause dandruff and rashes. Dry mucous membranes can lead to nose bleeds and (in women) vaginitis, caused by yeast infections. The US Food and Drug Administration warns that the drug may cause the premature closing of the ends of long bones, stopping further growth. The long bones in the upper body may continue growing until age 18, and the long bones in the lower body may still be growing as late as age 23. Use of Accutane may stop further growth. 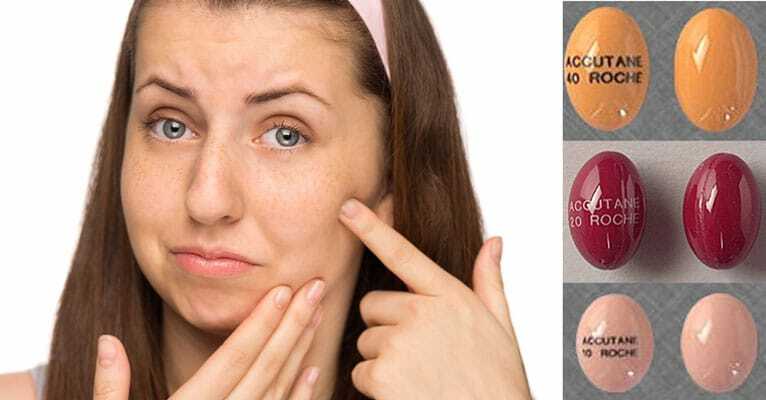 Users of Accutane who are prone to rosacea may have breakouts (even if they have never had rosacea before). There can be hair loss, eye irritation, permanent thinning of the skin, easy bruising, elevated liver enzymes, back pain, and high blood sugar levels. In rare cases, use of Accutane can result in loss of night vision, depression, formation of calcified cysts in muscle tissue, cataracts, increased blood pressure in the brain (cranial hypertension), and erectile dysfunction in men. Some of these side effects may become permanent. There also seems to be an increased risk of suicide associated with the drug. But the most serious side effects of the drug do not occur in its users. The risk of birth defects caused by the use of Accutane is real. Birth defects caused by Accutane are most likely to affect the frontal lobes of the brain. A child who is exposed to Accutane through the mother’s bloodstream in the first trimester of pregnancy may be challenged with severe learning disabilities. There have been cases in which an anecephalic (brain-less) child was born to a woman using the drug, although most of the time the use of the drug in early pregnancy results in spontaneous or intentional abortion. In the United States, a peculiar system called iPLEDGE has been developed to prevent the use of Accutane by women who could become pregnant. The iPLEDGE system is non-discriminatory. Women who have passed menopause are required to be enrolled in the system if they are to be given Accutane. And just in case some man might get pregnant, males who are given prescriptions for Accutane are required to be registered with the system, too. There is a 7-day window for anyone getting a first prescription for the drug. If a prescription is not picked up in those seven days, the physician must re-enroll them in the system. Patients are only allowed to get refills for Accutane as long as their physicians update iPLEDGE information every 30 days. Women are only allowed to use Accutane as long as they agree to use not just one but two different forms of contraception, and women’s prescriptions for Accutane begin on the second or third day of their menstrual periods, when there is no risk that they might be fertile. There are also restrictions on the use of Accutane in Canada, Australia, Colombia, Mexico, and Brazil. About 200 babies worldwide were born with birth defects before Accutane was regulated. Roughly 1 in 10 pregnancies of women who were taking Accutane results in the birth of a baby with serious developmental challenges. What Can Be Done To Reduce Other Side Effects of Accutane? 40% of Accutane users experience eye irritation. The remedy for all of these side effects is to avoid additional irritation and to moisturize. The corners of the mouth and the skin of the face should be treated with moisturizer and sunscreen daily. It also helps to avoid using lip balm or lip gloss that has flavors or fragrances and to avoid use of toothpaste and mouthwash that contain the ingredient sodium lauryl sulfate (SLS), since these can also irritate the corners of the mouth. People who wear contact lenses, in particular, may benefit from using liquid tears several times a day to keep the eyelids moist. I just recently began taking Absorica (basically the same thing as Accutane) and I am experiencing the worst yeast infection of my life. I have tried using otc ointment, salt water soaks, eating yogurt, abstaining from sugars, and I am still as miserable as can be. I don't know what else to do! I am taking acnotin for a 3rd month now....my skin is very much fairer but my menstrual blood is darker for this month....is this a very sever symptom? I'm using acnotin for 1 month and 2 days now. But the most result i hated is i got more pimples that i thought it become better. I don't know what to do. Should i stop it or continue using acnotin? Help me. A lot of the time the medicine will make your skin and acne worse before it can get better. Very normal side effect. can i take 2 pills of acnotin 20mils in a day, like one in the morning and another in the evening? I am also on Epuris, 40 mg a day for about a month and a half now and I am extremely itchy, all over my body. I moisturize all over daily (which only helps for about an hour) and I use my eczema cream for the really rough patches, and again, not much help. Can someone offer any advice?